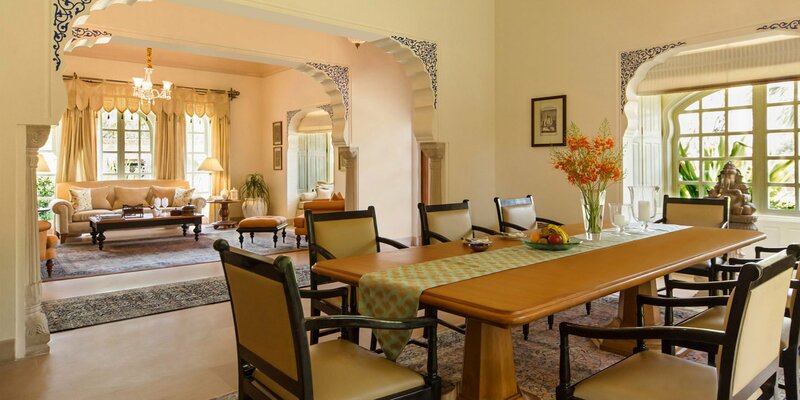 The Oberoi Rajvilas makes for the perfect base in which to explore the exotic Indian city of Jaipur, and is arguably one of the finest resorts in Rajasthan. There are not many hotels in the world where check-in involves an elaborately painted elephant and fragrant shower of rose petals, but the Oberoi Rajvilas does not settle for anything less than spectacular. Nestled on the edge of the Pink City, this opulent 32 acre resort almost feels like a destination in itself. Its sprawling gardens are peppered with decorative Mughal-inspired fountains, along with a 250-year-old Hindu temple and Rajasthani haveli (intricately carved mansion). This historic haveli now serves as the tranquil Oberoi Spa, offering holistic, Western and traditional Ayurvedic treatments. 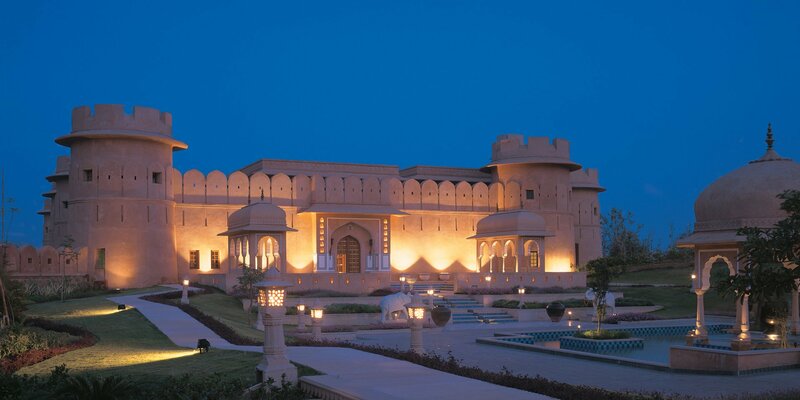 The Oberoi Rajvilas is drenched in romance and sheer luxury, perfect for those who are seeking a royal experience in Rajasthan. The peaceful ambience is a true respite from the utter whirlwind of the Pink City, yet it’s grand fort structure blends seamlessly with Jaipur’s rich history. Influenced by the majestic forts and palaces of princely Rajasthan, the interiors are adorned with exquisite gold leaf hand painted frescos, and colourful miniature paintings. 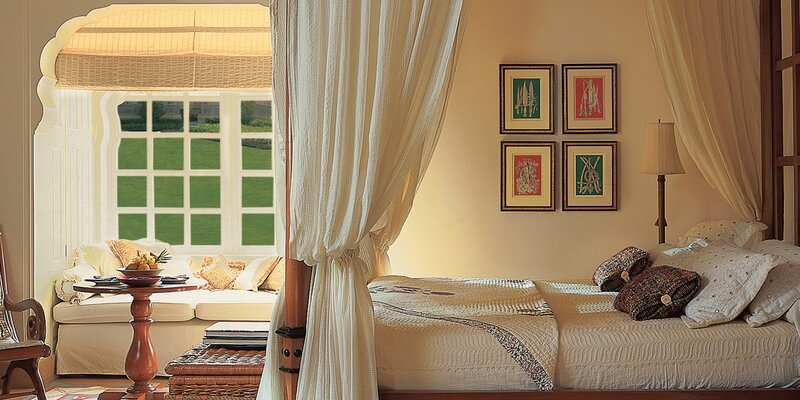 In signature Oberoi style, the service is extremely attentive, yet discreet and unobtrusive. The Rajvilas even employee a handful of staff with the sole responsibility of shooing pigeons from the pool! The starting category at the Oberoi Rajvilas is the Premier Room. There are 54 Premier Rooms throughout the property, which are located in small clusters of four and six. Each of these clusters have their own central courtyard, adorned with a fountain and garden. The elegant bedrooms boast four poster beds, marble bathroom and sunken bath, which overlooks a private walled garden. The following category is the Luxury Tent, in which there are a total of 13. The tents are draped with hand-embroidered fabric, featuring traditional Rajasthani block-printed motifs. The chic interior features timber flooring, a king size bed, dressing area, four fixture bathroom and free standing claw-foot bathtub. Each Luxury Tent opens out onto its very own private garden and terrace. 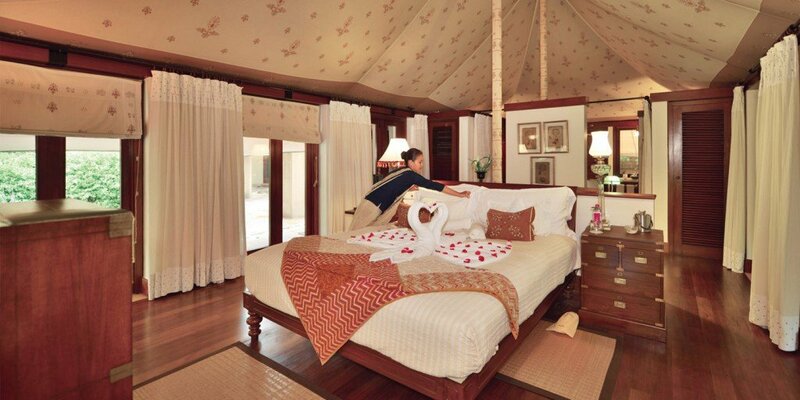 The Royal Tent boasts two individual tents; one as the master bedroom and the second as the living area. The living area tent features a dining table spacious enough for six guests, along with comfortable lounging area, an individual washroom and writing table. The grand bedroom tent offers a king sized bed, dressing area with two spacious closets, a four fixture bathroom and the signature free-standing claw-foot bathtub. The Luxury Villa with Private Pool is the fourth highest category offered by the Oberoi Rajvilas, and measures a vast 355 square metres. The villa has its own private swimming pool which is heated during winters. The bedroom boasts a four poster king size bed, dressing room, walk-in closet, marble bathroom, sunken bath and private walled garden. The Luxury Villa also features a separate living area, and a romantic outdoor dining pavilion which overlooks the private pool. The true jewel of the Oberoi Rajvilas is the Kohinoor Villa, which has been frequented by celebrities, royals, politicians and even Bill Clinton. The Kohinoor is spread over a whopping 1057 square metres; it features private gardens, private 60 foot heated pool, an outdoor dining pavilion and elegantly appointed individual accommodations. The master bedroom has an adjoining comfortable lounge area, as well as an additional guest bedroom and separate living area which opens out onto the gardens and pool. Each of the Kohinoor’s bedrooms has an en-suite bathroom and sunken marble bathtub. During peak season (October – March), Premier Rooms at the Oberoi Rajvilas start from approximately ₹35000 per night, including breakfast and taxes. Get in touch with us for exclusive offers during summers; you may stay for a complimentary third night, enjoy complimentary select beverages between 6pm – 7pm, and much more.